My big girl turned 6 last week! I can hardly believe she's that big. 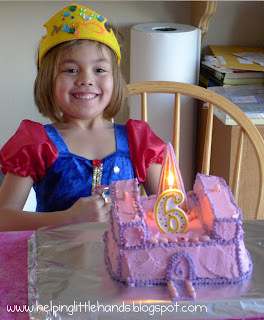 Firecracker wanted a princess party...more about that soon (probably tomorrow)...so we needed a cake fit for a princess. She would have liked one with the Disney princesses on it, but I wasn't feeling that confident in my artistic abilities with frosting...and I'd rather things at this house don't have to be Disney to be fun. 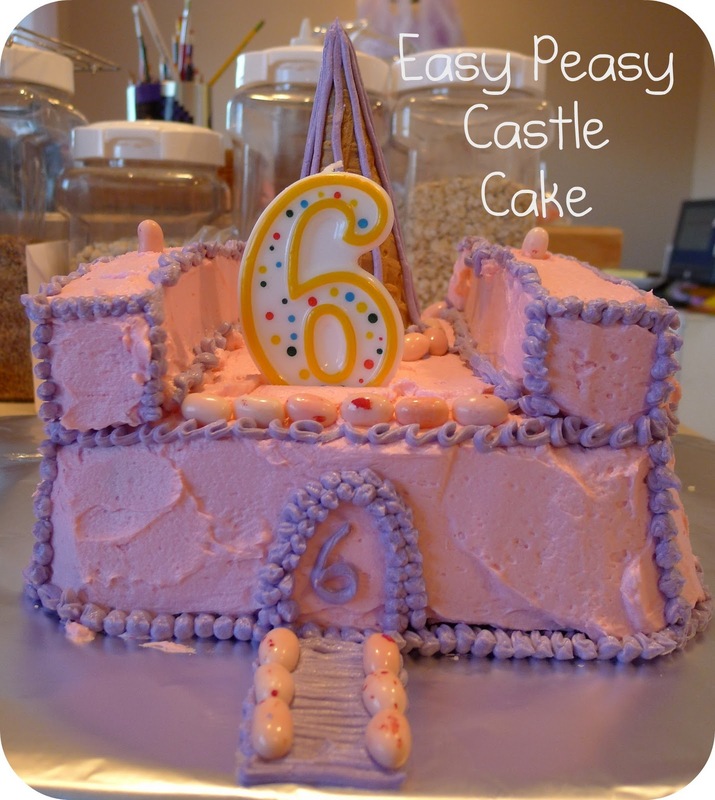 We agreed on a castle cake. There are a ton of cute castle cakes on the internet, but I vowed to keep mine simple. As I was getting ready for the party, I kept putting the cake off for last. I knew it would take longer than I wanted to decorate and I was dreading it. Finally with less than an hour to go, I figured I better get decorating. It's even simpler than I'd pictured...but for the effort I put into it (not much), it turned out amazing. 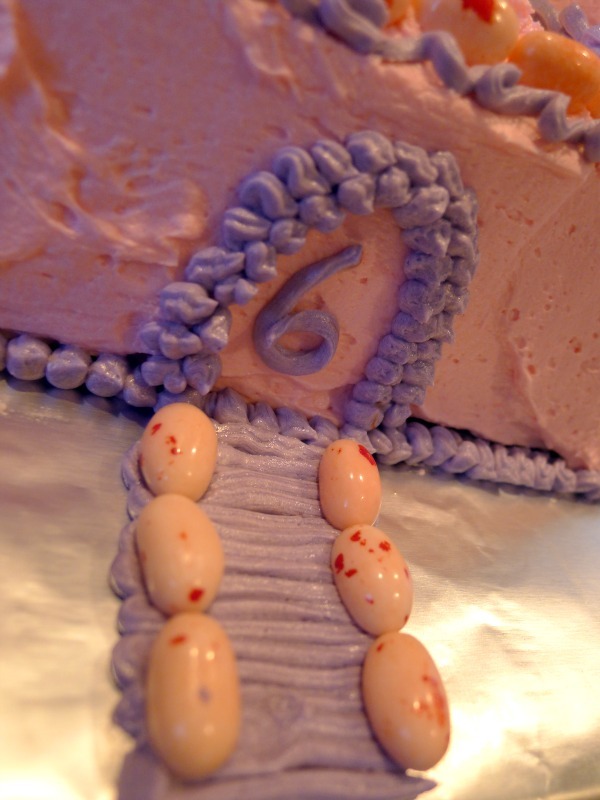 This took me about 45 minutes to decorate, including making the frosting. I cooked a whole cake mix recipe in a 9x9 pan for the base. It took some extra time to cook because it was thick. The monster cupcakes from earlier in the week had needed about 1 1/2 recipes of cake mix, so I cooked the extra half a recipe in a bread pan. I cut that up to make the raised parts on the side and still had about half of that left over. After I'd put the whole thing together and frosted it, I remembered I needed to include the ice cream cones...so I put one on in the middle. 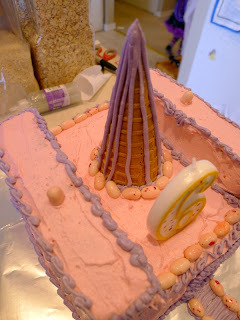 I took the left over pink frosting from covering the cake and added purple to it do the trim...so only one frosting bowl. I have cake decorating equipment, but I just piped all this out of a ziploc baggie with the corner snipped off. I showed it to Little Brother about 5 minutes before the girls walked through the door, and asked him what it was. He said it was a church...so I figured I'd done all right. Firecracker REALLY wanted a #6 candle instead of the usual 6 candles, so that's what she has. The little girls were super impressed with it. It's so nice they're easy to please! That is REALLY awesome! Such a fun cake for a birthday, I'm really impressed. That's really nice! 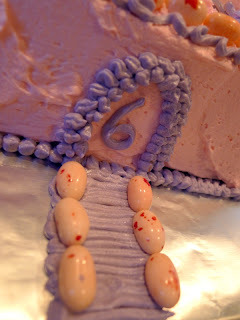 I really want to learn how to decorate cakes. I'm currently learning how to sew, so maybe after that :).